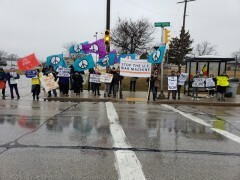 Milwaukee community rallies against U.S. attack on Syria | Fight Back! Milwaukee, WI – About 40 people came out during a record storm, April 14, outside of the U.S. Army Center, rallying against the attacks by the U.S. on Syria, and to stand in solidarity with the Syrian people. The event was sponsored by the End the Wars Committee of Peace Action Wisconsin, Young People’s Resistance Committee, Milwaukee Anti-War Committee and by Freedom Road Socialist Organization.